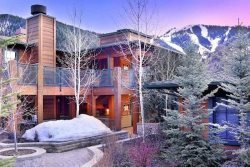 Enjoy Mountain and Golf Course Views and Sun Valley Resort amenities! This gorgeous, recently-built mountain home (2014) features 5 spacious bedrooms, 6.5 baths, and a double-story Great Room with a wood-burning fireplace and windows overlooking the Sun Valley Golf Course and Bald Mountain views. Designed with an eye toward entertaining, this 7,000 sq. ft. home comfortably sleeps 12 and has a separate living and dining room, media room, a gourmet kitchen with 2 refrigerators and 2 dishwashers, and an upstairs and downstairs laundry facility. Also features radiant heating throughout and A/C upstairs. Located 10 minutes from town, this 3-level log home is beautifully furnished and has exquisite finishes and amenities, including 5 flat-screen TVs, SONOS, wireless internet, an outdoor hot tub and fire pit, and a stone patio with a barbecue grill. Guests also have privileges to the Sun Valley Resort amenities including the pools, hot tubs, and guest discounts to Sun Valley Golf and Tennis (seasonal). This handsome luxury home is perfect for family or friends who want to pamper themselves after an active day of skiing, fishing, hiking or golfing. Developed by Averell Harriman in 1936 as Americas first destination resort, the Sun Valley Resort was an instant success. Within the Sun Valley Village, guests enjoy access to Golf, Tennis, Pools, Horseback Riding, free Sun Valley Summer Symphony performances, XC Skiing, Ice Skating and Skiing at Dollar Mountain.